The lowest stack rooms at the National Diet Library are 30 m below ground level, 8 floors down. The National Diet Library in Chiyoda City, Tokyo, has more books than any other library in Japanabout 7.5 million volumes. According to provisions set out in the National Diet Library Law, every book published in Japan is to be deposited in the library. Each year, 80,000 to 100,000 books are added to the collection. About half of this huge collection is stored in the Annex, which opened in 1986. The Annex stretches about 148 m east-west and 43 m north-south. It has 12 floors, and 8 of them are underground. 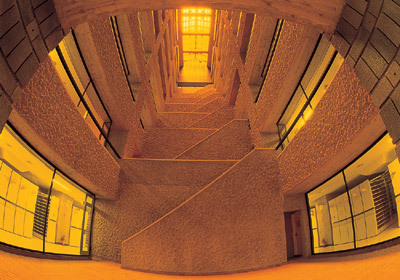 The lowest part of the building is 30 m below ground level. In the stack rooms, the temperature is maintained at 22°C, the humidity at 55%ideal conditions for storing books. As one way to prevent water infiltration or excess humidity in the stack rooms, there are no toilets below ground, and only one place to wash one's hands. The books are to be stored forever, theoretically, so the collection continues to grow. Over the last few years, steps are being taken to record books on microfilm or as digital data. From this we can assume that the National Diet Library Annex, the first huge underground library constructed in Japan, will be the last one the country will ever need. A thick layer of stone called oya-ishi (a type of volcanic tuff) lies under the city of Utsunomiya and its surroundings in Tochigi Prefecture, in the northern Kanto (Tokyo) region. The tuff has been used for centuries as a building stone for walls and foundations because it resists erosion and is fireproof, yet is soft enough to cut easily. In the second half of the 19th century, miners developed ways to dig deep into the earth, following the tuff layer underground. The ancient quarries and mines remain to this day, many of them abandoned. One of the mines closed in 1986 after almost 70 years in operation, and has since reopened as the OYA Stone Museum. The old mine is essentially a huge cavern with a floor area measuring 20,000 square meters, equivalent to about two soccer fields. The floor lies 30 meters under the ground. The museum explains how the tuff was formed and gives a variety of information on oya-ishi stone, such as its distribution and the history of the mines. 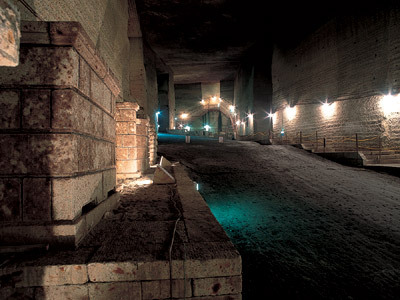 This huge cavern was formed over 70 years of stone-mining works, and is now an interpretive center and hall for events. What impresses visitors the most is the huge size of the mine, the way the rocks were cut out in geometric shapes, and the uncanny atmosphere of the cavern. The cavern is also used for art exhibitions, concerts, and performances of traditional Noh theater, and as a location for shooting movies and TV shows. In addition, a wedding hall, called Ishi no Kyokai ("The Stone Church"), was constructed there in 1993. The old quarry certainly has plenty of ways to attract people.